Huge Brandon Sanderson fan that I am, I try to read everything he writes, but especially the works that take place in his fictional universe of the Cosmere. But while I have read all the novels, somehow many of the novellas seem to have slipped through the cracks. When a lot of the stories have only appeared online or in other anthologies, it can make tracking down every single one a challenge. Enter Arcanum Unbounded: The Cosmere Collection. It feels like I have been waiting my whole life for this. Collecting eight previously published short stories and novellas plus one new never-before-seen tale that takes place in the world of The Stormlight Archive, this anthology is a must-have for every Cosmere geek. The Emperor’s Soul is the only story I’ve read previously before coming into Arcanum Unbounded. It remains one of my favorites of all time, the only novella I’ve ever rated a full five stars and I was ecstatic to see that it was the first story in this collection. Taking place in the world of Elantris, it follows a thief and forger named Shai who is captured by agents in a foreign land and made to craft a new soul for their emperor. Re-reading this story reminded me all over again why I loved it the first time; clocking in at just over one hundred pages, it manages to encompass everything I would expect from a full-length novel—intricate world-building and incredible character development, with a unique magic system to boot. Few authors can manage a feat like this, but Sanderson captures my imagination whether he’s penning short fiction or thousand-page epic fantasy tomes. Certainly The Emperor’s Soul shows he is not only a writer but an artist, or at least someone who understands how making art feels, based on his excellent characterization of Shai. This is a brilliant novella with a touching and powerful message. This short and sweet tale was meant to fill a gap in the plot of Elantris, giving readers some backstory into the book as well as a brief look at what happened after its climax. It would have very little impact and meaning if you have not read Elantris yet, and the author’s note even recommends not reading this until you have finished the novel in case of spoilers. As it was not meant to be any more than just a quick filler story, I was not surprised to find it somewhat lacking in substance. For the purpose it was meant to serve, however, it succeeded marvelously, and I also liked it more once I read the nice postscript that explained how the idea for The Hope of Elantris came about. This was a story written specifically for the Mistborn tabletop RPG, so it was no surprise that it read very much like an introductory primer to the world, magic, and characters of the series. It also takes us back to a much younger Kelsier, so those who are interested in his past will likely enjoy this look at his training days with his mentor Gemmel. Fans of the original Mistborn books will probably like this more than readers unfamiliar with the trilogy, despite it being very short and containing more exposition than your typical short story. If you’ve ever read his Alcatraz series, then you know that Brandon Sanderson has an interesting sense of humor. It definitely comes out again here in this second short story written for the Mistborn RPG, except this one takes a much different tack. Chronicling the adventures of Allomancer Jak with helpful (and hilarious) footnotes provided by his faithful Terris steward Handerwym, this story is Sanderson’s tribute to the classic pulp tradition. Jak reads like an over-the-top, satirical version of Wax from the later Mistborn novels, which was apparently the author’s intent. A delightful and entertaining read complete with a dash of unique humor, giving this one considerably more “personality” than The Eleventh Metal. This was perhaps my most highly anticipated story of this collection, and it did not disappoint. Intended to be a companion novella to the original Mistborn trilogy, this shouldn’t be read until you complete those first three books or else you will be utterly confused, not to mention the presence of major spoilers. Also, you won’t be able to fully appreciate what a touching, emotional tale this is. Secret History tells the story of what happened to Kelsier after his death at the hands of the Lord Ruler, and as such, it features strong mystical themes dealing with fate and the afterlife. I’ve never made it a secret how I feel about The Hero of Ages and how it ended (it was a punch in the gut) which has always soured me somewhat on the entire trilogy. I have to admit though, this novella changes things. The void I have felt inside of me for so long has been filled in a bit, and my appreciation and understanding of the series has increased. No question about it, Secret History is a must-read for Mistborn fans. An eighteen-page excerpt of the White Sand graphic novel is included with this collection, followed by the written draft which formed the basis of the comic adaptation. It follows Kenton, the youngest son of a Sand Master but shows weak affinity for the magic himself. This is an older story, and as such you can some of the roughness around the edges, and the magic system is a lot more straightforward relative to Sanderson’s later work. However, I did like that we got to read about a character who had little magic power; much fun was had watching Kenton come up with creative ways to overcome challenges and defy the masters. This was also a highly action-oriented tale. Originally published in the Dangerous Women anthology, this story features an innkeeper named Silence who shelters travelers passing through the gloomy, haunted forest. Revenge is the name of the game as we follow our protagonist and her daughter into the wild to track down and kill bad folk. There’s also a strong sense of frontier lawlessness to the setting, which is crawling with bounty hunters, corrupt enforcers, and vengeful ghosts. This was admittedly not my favorite of Sanderson’s novellas, but it does show a darker side to his storytelling that we don’t get to see often. Again, I did not find this novella to be among Sanderson’s best, but many of the ideas in here are very interesting. It follows a Tracker whose main trade are magical birds found only on the sacred islands of the Archipelago, with his life being increasingly disrupted by the gradual encroachment of society and technology. I love the setting established in this story as well as the mysteries surrounding the Aviar, though I wish there had been more time spent on the birds’ special link with their owners. I didn’t feel like I had enough time to get to know the characters either; all told, this story could have afforded to be a little longer but I enjoyed it for what it is. Of the entire collection, Edgedancer is the story Cosmere fans will be mostly likely talking about. For starters, it’s completely new, and it’s also from the world of the Stormlight Archive. Sanderson shines the spotlight on Lift, the scrappy young urchin with a special gift who first appeared in Words of Radiance. We plunge headfirst into adventure with Lift and her spren Wyndle in this sort-of origin story, though she’s also not the only familiar face to turn up within these pages. We’re given a closer look into her life and personality, and you can tell she’s definitely being built up for a larger role in the main series. I also really enjoyed getting a more detailed picture of Tashikk and its culture. This final story will make you smile, and if Lift hadn’t made an impression on you before, well then she sure will win your heart here. 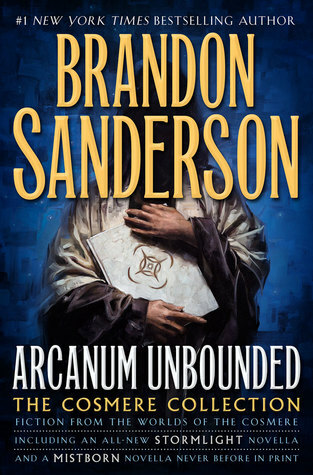 Closing Thoughts: Arcanum Unbounded is a must-read for every Brandon Sanderon fan, though for best results it is recommended that you have already completed Elantris, the Mistborn series, and the Stormlight Archive series in order to enjoy the full impact of this anthology. But even if you are a reader who simply enjoys spending time in Sanderson’s worlds without being all that concerned with how they fit together, you will be amazed by the all-encompassing and in-depth quality of this collection. The stories themselves are fantastic of course, but you are also guaranteed to walk away from this with a better understanding of the immense and epic macrocosm that is the Cosmere. Arcanum Unbounded is now one of the most treasured books on my bookshelf. Yes! Starting Mistborn: Secret History right after finishing The Hero of Ages will actually be PERFECT! The Emperor’s Soul is just beautiful. And you know how picky I am about my short fiction! It’s the only novella that’s ever made me feel like weeping afterwards. Not many full-length novels can even touch me so emotionally. I really need to read more of Sanderson’s books. I’ve only read a couple. Awesome 🙂 The nice thing too is, there’s quite a lot of books/series to choose from, that’s for sure! Of all the stories, I still loved that one the best. I might even go as far to say i’s worth picking up the antho for The Emperor’s Soul alone, the pb can be hard to come by and in some places it’s 2/3s the price of Arcanum Unbounded. I really want this – I’ve read Emperor’s Soul already but it would be great to check out all these others – plus 4.5 stars. Get in my life. Yeah, I went into this one having only read The Emperor’s Soul. But so worth it to finally read the rest of the Cosmere shorts. Super excited about Mistborn: Secret History!! Should I read his Alcatraz books before or not? I think it’s his only series I haven’t read yet! You don’t need to read the Alcatraz books before this one, since I’m pretty sure they’re excluded from the Cosmere and there are also no stories in this that are linked to series outside of Stormlight Archive, Mistborn, and Elantris. Ahhhhh okay thanks!! I hadn’t realised it was not in the Cosmere! Yes! Finally! I’ve wanted to read it for so long and it was as awesome as I expected 🙂 All the praise was spot on.